Life is so crazy. I spent the past weekend in New England, having a wonderful time. We got back late last night, worked early this morning, and had to take the car in to the shop after I got home, then throw together a quick dinner so we can go to bed early. I roasted some vegetables to go alongside, and there was dinner! These wings are so great. Alex and I both had sauce all over everything, arms and faces. They're a little sweet and a little spicy and oh so good. Preheat the oven to 425. Crush and roughly chop the garlic, and stir together in a bowl with the salt, honey, soy saice, chili-garlic paste, hoisin sauce, and sesame oil. Add the wings and toss to coat. 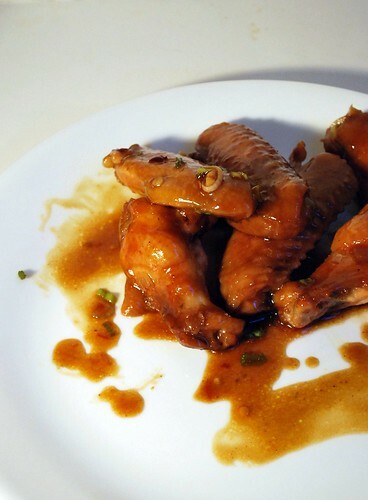 Spread out the wings on a cookie sheet, pour the rest of the sauce over. Bake 35-40 minutes, turning once. 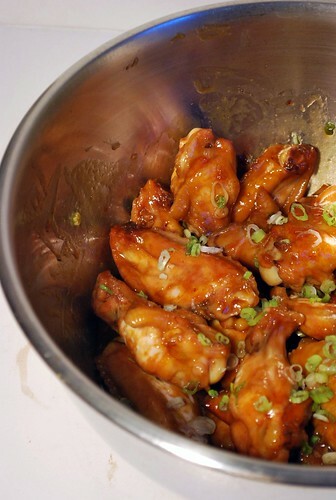 Remove the wings to a bowl, pouring the remaining sauce into a small saucepan and heat to a simmer. Stir the cornstarch into a little bit of water (about 2 T) until dissolved, then stir into the sauce. Cook 2 minutes until thickened a bit, then pour over the wings. Sprinkle in scallions, toss to coat, and serve. Oh, my, those look good. Now I just need to find the hoisin. I can have the whole plate to myself! Thanks for another great recipe. My entire family loved this. Put some sauce on tofu cubes for my vegetarian daughter; everyone else gobbled down the wings. Served it with rice. Big hit!